Once again, Lewis Hamilton and Mercedes are those on top of the world. It has been clear that team and driver were the differentiators this year, as reliability favoured championship rivals Ferrari and the cars both had convincing attributes over one another. A mixture of appalling reliability, driver mismanagement and mistakes ruled Red Bull out of the key silverware very early on. Such as the nature of modern Formula 1, the runners from ‘Class B’ very rarely featured at all. This needs to change. But enough of the tangent here is the bottom half of the 2018 class’s review. Remember, the average ratings are nothing more than an opinion. 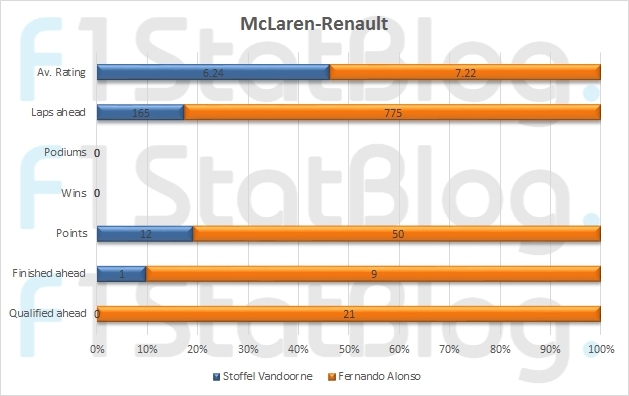 Stoffel Vandoorne’s second and (what could well be) final season in F1 was a complete disaster. Absolutely whitewashed by his team-mate in qualifying and with only a handful of decent performances to brag about such as a charging drive in Bahrain and a brilliant strategic drive in Mexico. Something seriously went wrong this year, and Formula E-bound Vandoorne must rescue his career outside of F1. There’s obvious talent shown in the junior ranks that McLaren simply failed to harness at a dismal time for the team. It is somewhat unfair that Vandoorne hasn’t been given the chance to really show us what he’s made of. He was given a grenade of a car in 2017, and one that was often terrible in 2018. FE’s gain is F1’s loss. Mercedes’ gain is McLaren’s loss. This has not been a fitting farewell for a two-time champion with the talent Fernando Alonso has. He is fed up with F1, and he leaves for pastures new with many bridges burned – something that seems to be harming him in other areas of motorsport. There have been times where Alonso has dragged something from nothing, yet frustratingly situations arise where he’s pointlessly getting himself in fights he has no right in being involved in. He may have decimated Vandoorne in qualifying, but with the pre-season target of Q3 in every race – something achieved just twice, one does wonder whether there was a little bit left on the table despite that. Alonso’s reputation has taken a battering this year, despite a strong season considering. What a sad way to bow out of F1. 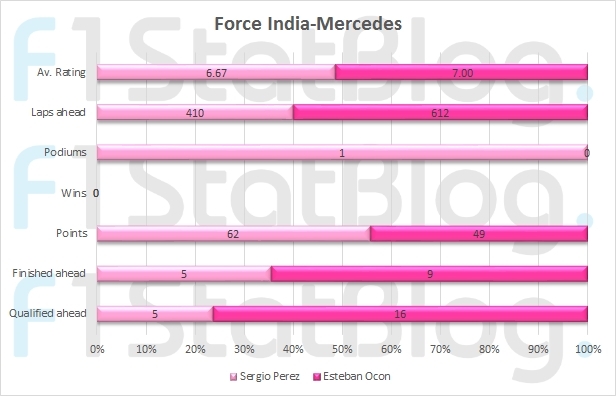 Sergio Perez went from narrowly edging his younger team-mate in 2017 to being narrowly edged by him in 2018. The qualifying battle looked much more one-sided than reality as the gaps were often tiny. One reason why Perez’s rating is slightly less than Ocon’s is for putting in the single worst performance of any driver during the season in Singapore. His obvious high, however, was being there to pick up the pieces in Azerbaijan and score the only podium for a driver in ‘Class B’ all season. He admitted that off-track dramas involving himself and his team played a role in his performance during the year. It was by no means a bad season, but his 16th in the rankings is more down to the closeness of the field than a disaster of a year from Perez. However, there was definitely more potential. It is a complete disgrace that Esteban Ocon will not be on the Formula 1 grid next season, after a year where he largely edged one of the consistent midfield performers in equal machinery. What is crazier is that he has been more impressive than one of the drivers in the parent team. Ocon’s rating would be higher if not for two woeful displays of driving – in Azerbaijan and in Brazil. However, he largely impressed – especially by edging Perez so frequently in qualifying, and as a result, his placement in the overall standings doesn’t quite do him justice. His most impressive performances of the year came in Monaco – with a brilliant sixth place finish after qualifying very well and with a super lap to get a ‘Class B’ car on the second row in Belgium. 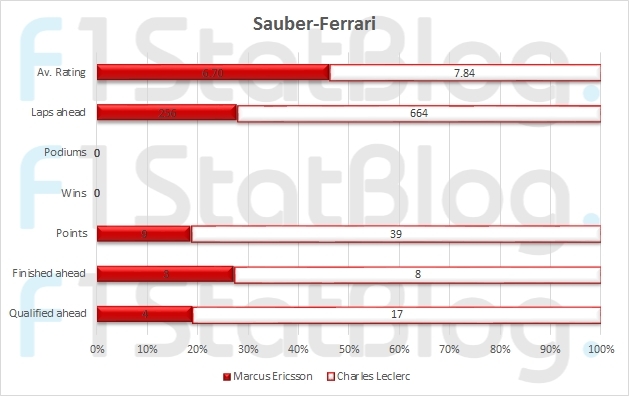 Marcus Ericsson has been very soundly beaten by his rookie team-mate this season, yet it has probably been his strongest season in F1 to date. So, it’s somewhat ironic that he’s on his way out – to pastures new with the competitive Schmidt Peterson IndyCar team. Ericsson had some moments of absolute brilliance this year – a battling ninth in Bahrain well before the Sauber came on strong and taking the team’s best grid slot of the season in Brazil. But there were also moments in the middle of the year where he looked all at sea while his team-mate was racking up some serious points. He’s also been the victim of a few nasty DRS-related shunts this year. Ericsson was finally starting to look like a solid F1 driver, and now he’s on his way out. This young kid is something else. This is a talent of a similar magnitude to Verstappen but with more humble tones and more finesse. Charles Leclerc fully deserves his promotion to Ferrari after just one year. He has frequently produced spellbinding performances and there are only a handful of things he needs to work on before he becomes the complete product. He qualifies well, he races superbly, he can battle with some of the best, and he is able to manage tyres. There is a question over whether he has the utter ruthlessness that those at the very top have, and he also admits that he has work to do in wet conditions. Can he beat Sebastian Vettel in the same equipment? If Vettel has another year like 2018, then absolutely. His start to life as a grand prix driver started off quite slowly, but from then on, he has only looked stronger and stronger. The new generation of star is here, and Leclerc is a potential champion – many times over. It has not been without its flaws, but Pierre Gasly’s consistent upward trajectory since breaking his 1000-day win-less drought in 2016 continued into his rookie F1 season. Some of his drives this year have been simply awesome – taking Honda’s best result since returning to F1 in Bahrain and a strong seventh in Monaco after a mammoth stint on Hypersoft tyres both securing perfect scores. His Hungary weekend was also excellent. He quickly asserted himself as Toro Rosso’s top man, even if his performances tailed off a bit towards the year. There were some poor drives as well – clattering into his team-mate in China and causing a bit of mayhem in his home grand prix to name a couple. Can he cause an upset and beat Max Verstappen in what is now the Dutchman’s team? Quite possibly. His Honda knowledge over the past two years will be invaluable to him in that fight. Hartley’s transition from sportscars with long-lasting tyres to the unique Pirelli-shod F1 cars took much longer than the time permitted for Hartley to make an impression. By no means has Hartley looked out of his depth at any point during the season, but it was clear that there was a performance deficit to the other car that remained for much of the year. Such is the brutal nature of F1, Hartley’s seat was allegedly under threat as early as Canada this year. By the time it all clicked for him – with that mega opening lap in the United States translating into a fantastic ninth in the end, it was clear that his time was limited. 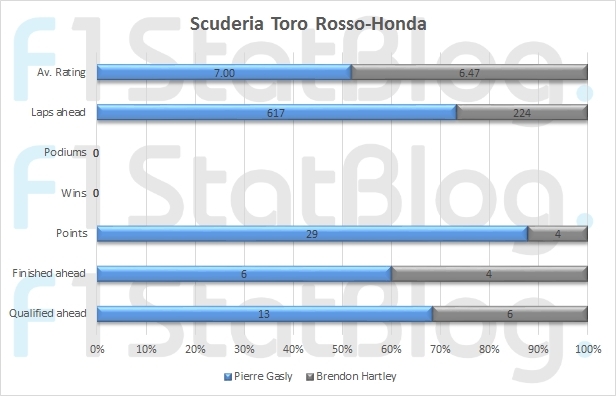 It would have been nice for Hartley to have been given a second season, especially as he was right on Gasly’s level (and regularly above it) by the end of the year. Hopefully, he will end up in a top seat elsewhere in motorsport because he deserves to be in one. 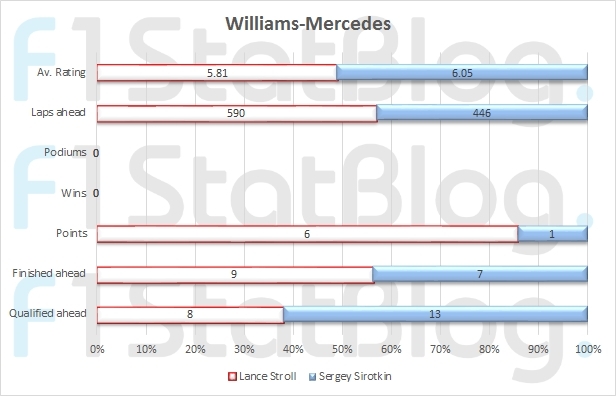 Lance Stroll’s rating is perhaps somewhat harsh, but there were few positives to talk about given that he was equipped with a complete mess of a car produced by Williams. One thing worth talking about is salvaging points on what was perhaps the two weekends the Williams looked like it could contend for them – in Azerbaijan and in Italy. He also started in the top 10 on both occasions. His first laps were often demonic but other than that there has been absolutely nothing to shout home about. It’s difficult to judge just how well or how poorly Stroll did. Like his team-mate, it’s difficult to judge Sergey Sirotkin’s performance. His commitment has been brilliant, however, and there were a few really standout drives that went completely unrewarded. He also had the upper hand in the qualifying battle over his team-mate, even if his best performances weren’t quite as peaky as Stroll’s. His Monaco drive – where he dragged that awful car into Q2 only for it to give up on him in the race, was awesome. His battling drive in Singapore – again, where the Williams was dire, was also completely in vain. With his primary sponsor’s backing pulling out, it would seem as if his F1 days (at least for now) are numbered. Sirotkin has by no means been a terrible F1 driver, but like so many others in 2018, things just didn’t quite work out for him.